ALTHOUGH THIS PROGRAM IS BASED ON 25 DAYS- WE HOPE TO INCLUDE THE OPTION OF 5 EXTRA CAMP DAYS FOR THOSE YOUNG ATHLETES WANTING A BIT MORE! Our U10 (Nancy Greene) program is a fun, progressive and exciting program for athletes between the ages 6 and 9 to be a part of. It is a 25 day program with most training days taking place on Sundays throughout the winter. There are also occasional mid week camps which coincide with school holidays. There are approximately 3 races throughout the season, both at home in Jasper, and away at other ski areas, which gives the athletes a good introduction to ski racing. Groups are split at the start of the season according to a number of factors including age and ability. We create a safe and friendly learning environment where we hope not only to improve the athlete's skiing ability but also 'soft' skills such as leadership and teamwork. 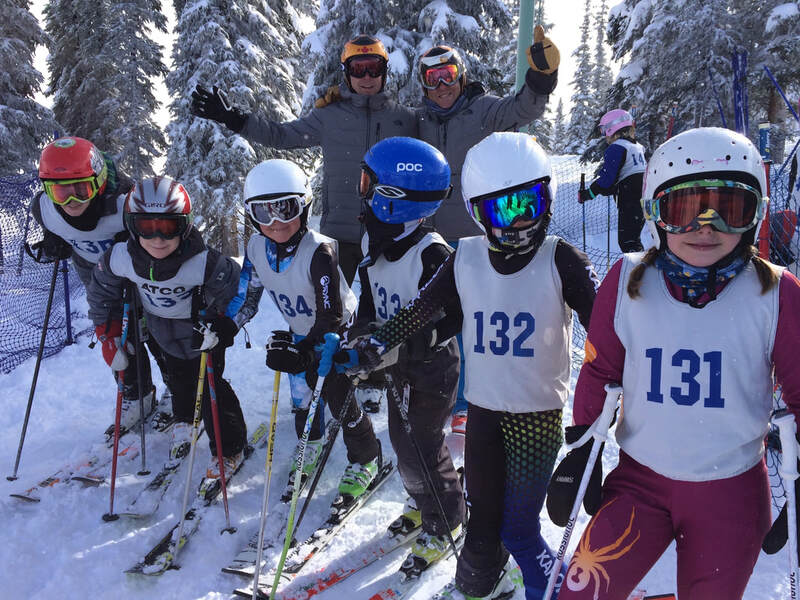 Our U10 Plus program provides an opportunity for those super keen 9 year old ski racers desiring a more intense ski racing program, to ski and train some extra days. This 35 day program is super fun and challenging, and requires an advanced level of skiing, and on- mountain independence in order to keep pace with the group! Athletes will race in 3 NGSL races alongside them. Meet by the Jasper Ski Team race shack located in the far corner of Parking Lot 1 (building closest to the hill). Please be on time. If you are late, the first run of the day is usually on School House Triple Chair - parents can ski with their athlete to this chair lift to join the group. Please keep the trail from the parking lot to the ski slope clear at all times. This is a busy area and we need to do our part to allow public and Marmot Operations staff to pass freely. - Neck warmer, dry socks, dry boot liners & gloves – dry these items the night before. If they start wet, they get cold fast! We always eat lunch upstairs at the Mid-Mountain Lodge. No NUTS in snack or lunches due to allergies. Parents are encouraged to meet their kids for lunch. Please be on time to pick up your child. The coaches will stay with the Racers until they are met by a parent. If another parent or someone else is picking up your child this MUST be organized in advance. PARENTS OF SMALLER CHILDREN: If there is any question of your child’s ability to get on any of the lifts, you are asked to ski with your child’s group to assist with this. Also please be realistic with your child’s ability to take their pack to the lodge. You may need to ski with their group for the first few days.